STANCE|WORKS continues to grow as an international power in the realm of automotive media, and our reach extends across the globe. Sometimes, we're given the opportunity inspire some of the more surprising nooks and crannies of the car scene, however, even more special to us is the opportunity to support those who do the same for us. iAcrophobia, a collective of "passionate pioneers" as they put it, is doing their part to promote and grow the culture and community they've vested themselves in. iAcro's community, however, isn't the same you and I are so familiar with. iAcro's home turf is a staggering 9,900 miles away. They've been breaking the asphalt free from the streets of Beijing, China since 2008, culminating into an international presence today. Their mission is to not only transform the Chinese tuning scene, but carry it forward in a positive light. "We have relatively weak tuning scene here in China compared to western world. iAcrophobia provides the platform, which is for showing personal projects, sharing information, and exchanging ideas to fellow car enthusiasts. We want to be the pioneer in the fitment scene and want to affect the Chinese tuning scene so that it is developed and improved in the right direction." iAcro's story is one worth sharing on it's own, and one that we're eagerly anticipating; but before that, we figure it's only fair to start things off with a taste of how the boys do things. 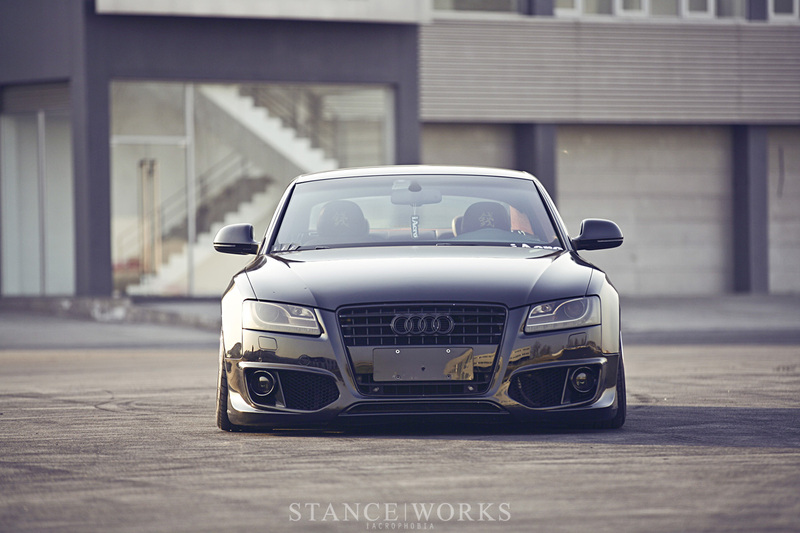 In the first feature is one of iAcro's own Audi A5s. The choice in styling blends euro and Japanese tastes to create something unique. 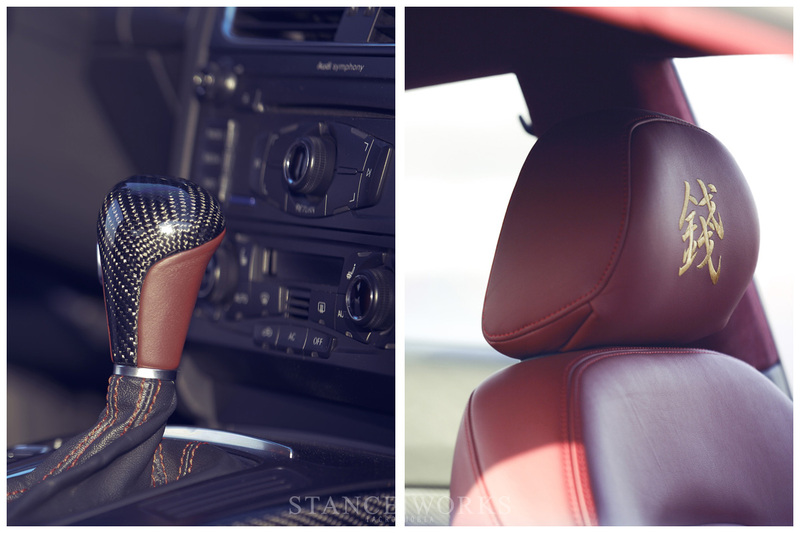 Working from the inside, out, the interior was custom wrapped with red leather and suede. Golden embroidery compliments the unique interior and certainly solidifies the country of origin. Custom carbon fiber accents were added throughout, including the dash, steering wheel, and shift knob. On the outside, the ABT body kit fits remarkably well, as does the OEM S5 rear diffuser. AccuAir management paired with air suspension, along with H&R swaybars, creates a surefire way to keep the luxurious nature of the Audi in check. Aired out, the car sits atop a set of 10 and 11.5" wide SSR SP-3s, reminding us that this doesn't quite sport the same parts checklist as the A5s we're used to seeing. An increased airway thanks to K&N and AWE means the car breathes pretty well too. This A5 is only one of an impressive number of cars that represent the iAcrophobia family, but it's far from where we stop. With a slew of more cars to share, iAcro is merely the tip of the iceberg that represents STANCE|WORKS's international following. So here's a call to our foreign readers: we're here to share your story as well, as we know there's more to our scene than what lies in our own country. Make yourselves known. A special thanks to the iAcro crew for the interview and photography, and we're looking forward to iAcro: Round 2.